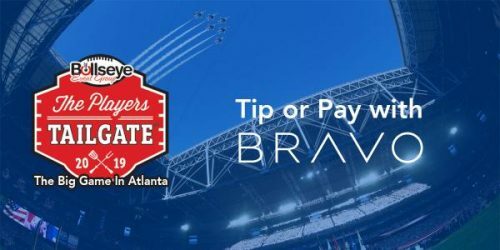 BRAVO, a mobile payments app, proudly sponsors Bullseye Event Group's pre-Super Bowl Players Tailgate Party this Sunday, February 3, 2019, at the National Center for Civil and Human Rights. ATLANTA,USA / JANE WALSH / JANUARY 30, 2019 / Hosted by America’s most recognisable celebrity chef, Guy Fieri , Atlanta’s number one party is described as a culinary experience in itself, where over 40 active NFL players, celebrities and guests eat, drink and get entertained before the big game. Chef Fieri will bring the all-you-can-eat menu, joined by Chef Aaron May, Chef Thiago Silva, Chef Ken Oringer, Chef Jamie Bissonnette, Chef Michael Voltaggio, Chef David Rose and Chef Lee Fox. Other special attendees include DJ IRIE, ESPN’s and Sage Steele. BRAVO is an exclusive sponsor and payment provider for the Bullseye Event Group Players Tailgate party in Atlanta. This seamless mobile payments app with enhanced privacy makes paying bills and getting paid safe and easy. Users connect by proximity (using GPS) and/or by search without exchange of private information. BRAVO can be downloaded for free in the App Store and Google Play. BRAVO service is geo-fenced for now in the USA with future availability in international markets. Featured in TechCrunch, Macworld and on ABC’s Shark Tank, BRAVO secured a deal with Mark Cuban and Lori Greiner. Since then, BRAVO has processed transactions worth many millions of USD. The app has significant traction in the industry and was recently mentioned on Fox News as a “go-to” tipping with privacy features. “The idea behind BRAVO is to financially empower musicians, video streamers, service professionals and micro-merchants who depend on payments and gratuities while protecting their privacy,” says Maria Luna, CEO and Founder of BRAVO Pay. She explains how proud they are of the milestones they have reached to this day and their success in delivering a safe and secure payment service to hundreds of thousands of people every day. What’s more BRAVO Pay prides itself in the long standing relationships it has been building along the way. These strategic alliances have formed a rock-solid foundation to set the app in good stead for many years to come. “It’s especially amazing when our partners share the vision and passion for what we do and the goals we want to achieve,” says Luna. “Today we bring you a partner we hold close to our heart and will continue to do so for the years to come, Bullseye,” she announces proudly. Bullseye Event Group, renowned as a pioneer for secondary ticketing and sports travel has been operating successfully for over 3 decades and continued to help grow the industry into the 30+ Billion dollar industry it is today by providing U.S Masters Golf Tournament and NFL Super Bowl travel packages since 1988. Today they are regarded as the most cost effective, user friendly and customisable ticket and sports travel group in the sport industry. We are quickly approaching the Big Game’s hottest pre-game event in less than a week and as they have been doing for the last few years, Bullseye Event Group are organising Atlanta’s number one pre-game party. BRAVO will be the exclusive payment provider allowing attendants to pay gratuities to their service professionals at the event and donate to Operation BBQ Relief (Not for Profit Disaster Response Team providing meals to those in need and first responders). “We couldn’t be more excited about Atlanta’s Bullseye Tailgate Party,” says Maria Luna. “The outrageous lineup of attendees that we will have the privilege and honour of meeting and enjoying the festivities with, is something we very much look forward to,” she confirms. By downloading and using the BRAVO app, attendants will have the opportunity to win amazing giveaways including an all-inclusive VIP experience for two at the 2020’s Tailgate Party in Florida and the opportunity to interact with BRAVO sponsored celebrities. Keep updated on BRAVO’s social and community channels to find out more or visit Bullseye Event Group. On the day of the event, Sunday February 3, 2019, see live videos and pictures by following BRAVO on their social network.